This level has hard difficulty. For this level try to play near to blockers and make special candy. Combine them with each other and use more striped candy. Combine striped candy with other special candy to get more chance to make special candy. I am struggling with this level. Would appreciate your support and cooperation.Thanks for understanding. J’ ai besoin ton aide. Merci pour m’ écouter. 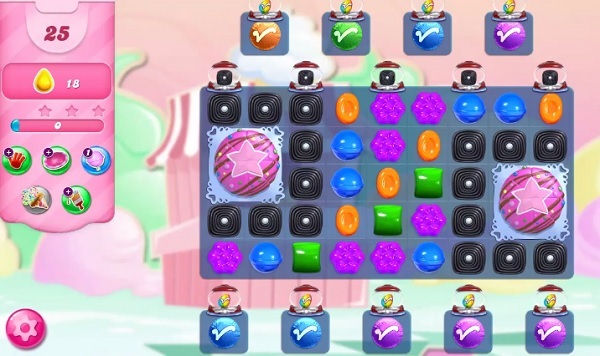 This level is near impossible even with boosters … I am ready to just quit candy crush all together over this one. FU FU FU FU CC!!! FIX THIS IMPOSSIBLE LEVEL NOW!!! FIX THIS POS LEVEL NOW!!! WHY CAN’T U DO THE SIMPLEST ACT AND FIX THIS IMPOSSIBLE LEVEL? DAMN IT CC, FIX IT NOW!!! CANNOT BE DONE!!!! STILL WAITING FOR U TO GET OFF YOUR ASSES AND FIX THIS LEVEL!! !